A quick visit to the worst place on Earth vet and here we are, a grumpy-emo dog who is pouting about the meds he has to eat and a gloating ah ma. Medication time is a TORTURE. Both to me and Mummy. Mummy: "Come Sam, time for your meds." Nope. Not happening. At all. There are a few ways to get those disgusting pills down my throat. For the morning dose, Mummy will painstakingly cut the meds into small sizes and hide them in my food. However, I get fed only once a day. Needless to say, the evening dose is wayyy trickier. She will either shove it down (I HATE MUMMY), or dissolve it into a liquid and feed me using a syringe. When we were in the States, there was a really easy alternative - Greenies Pill pockets! However, since we got back here, pill pockets for dogs are near impossible to find! We only manage to find it once and most pet stores don't even know what Mummy is talking about when she asks about it. So, what's the best way out? The equation is very simple: One wet ingredient, one dry ingredient and one oily ingredient! Multiple recipes we found online suggested milk. But many dogs are actually lactose intolerant (including me the fart machine). Hence, Mummy chose Coconut water instead. She also specifically bought dog-friendly brown rice flour. As for the oily ingredient, we had plenty of leftover Pee-nut Butter! Simply play around with the ingredients and choose what your dog isn't allergic to! 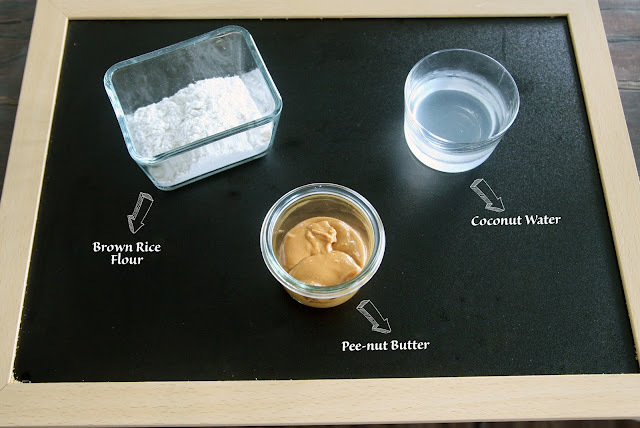 1 Tablespoon Coconut water, 1 tablespoon Peanut butter and 2 tablespoon of flour. And no more than 10 minutes of your time! Mix them all up into a dough using a spatula and roll them out into little balls. After rolling them into balls, use the end of a chopstick to create little dents (aka pockets). And there you go, your very own home made Pill Pockets! Sam: "How come the shape not consistent one?" Pecan: "Which shall I eat first?" Put the pill within the 'pocket'..
And wrap it up by pinching the treat around. And feed it to your greedy pet! Even if your dog doesn't require meds, it works as a yummy treat! This probably is the only time your dog will be begging for more meds! Store the remaining in an air-tight container and use it over the course of the medication! They will keep until the wet ingredient's expiry date. We said goodbye to our medication time struggles thanks to this! A happy Sammy means a happy Mummy! Just curious. Would it work the same to swab pee-nut butter on the pill directly?